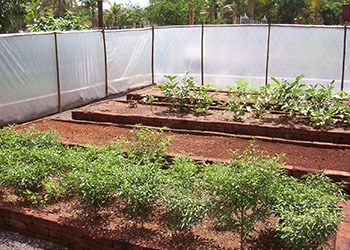 Raised beds are made of a mixture of sand and soil, laid on a plastic film. All the soil related limiting factors (wrong pH, soil compaction, salinity, nutrient deficiency, poor aeration, weeds, pathogens etc.) are eliminated. Using adequate water, high dose of fertilizers and micronutrients, we get three times the yield in most crop species.